365 Inspirational and Motivational Quotes of Wisdom about Life! 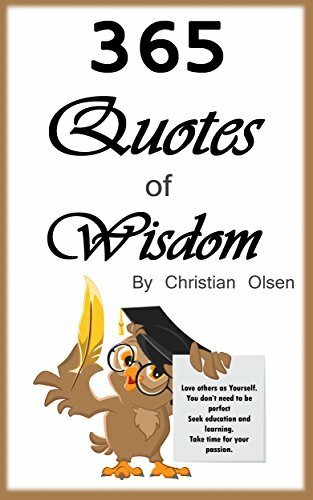 In this compilation of wisdom, you’ll find some extraordinary, life changing quotes, as well as some common sense, deep thoughts, philosophical insights, and everyday phrases to live by. They can help elevate your mood and make you think about yourself, the universe, religion, freedom, silence, meditation, gratitude, love, courage, success, and many other essential characteristics and ethics to our well-being. Spiritual leaders, philosophers, motivational speakers, foreign proverbs, and celebrities all add to this bundle of wisdom full of quotes and contemplations. So don’t wait! Get this giant collection of quotes and feel better every day by pondering life, gaining more confidence, and making more sense in all you say and do. Just click the “Buy with 1 click” button and start reading!